Your browser does not support wav audio. 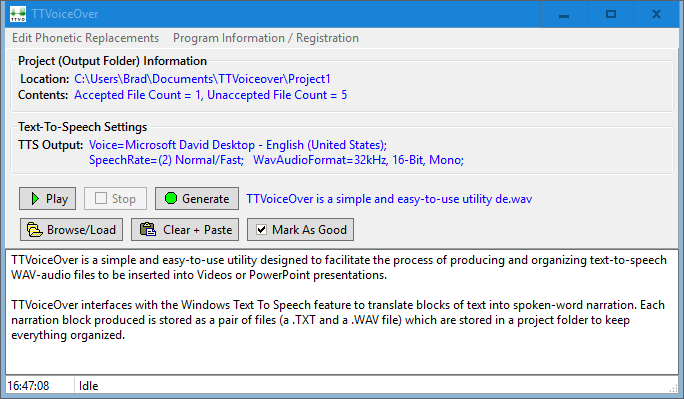 TTVoiceOver (short for Text-To-Voice-Over) is an easy-to-use Windows software utility for creating .WAV audio voice-over narration for use in Videos or Microsoft PowerPoint presentations using Windows Text-To-Speech. Additionally, TTVoiceOver has an excellent Phonetic Replacement feature which ensures that the text-to-speech reader pronounces all of the words in your project the way you want them to be pronounced. For more information, check here: Show Program Help. 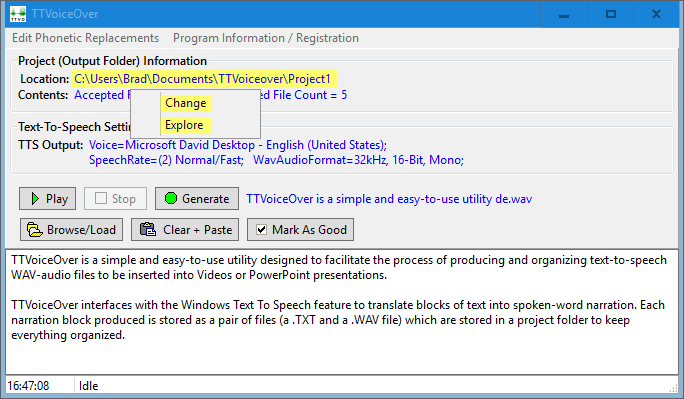 TTVoiceOver interfaces with the Windows Text To Speech (TTS) feature to translate paragraphs of text into voice audio. Each audio narration produced is stored as a pair of files (a .TXT and a .WAV) which are stored in a project folder to keep everything organized. 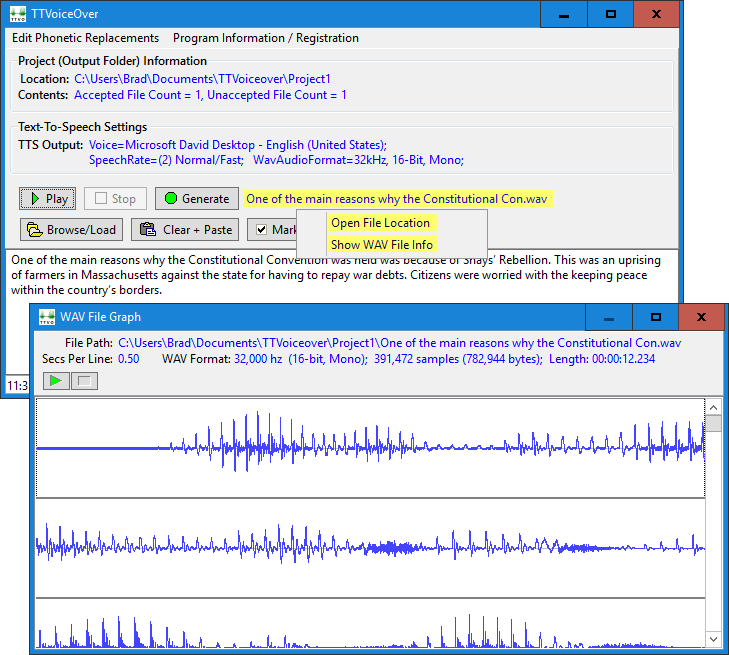 The blue labels are hyperlinks which access various configuration windows for the user to modify the settings to be used when rendering text-to-speech audio. Change : This menu option displays a browser from which new or existing projects can be created or opened. 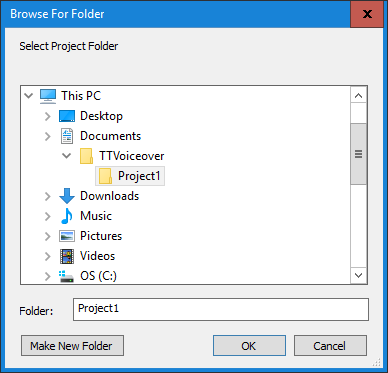 Explore : This displays the currently selected folder in the Windows Explorer. 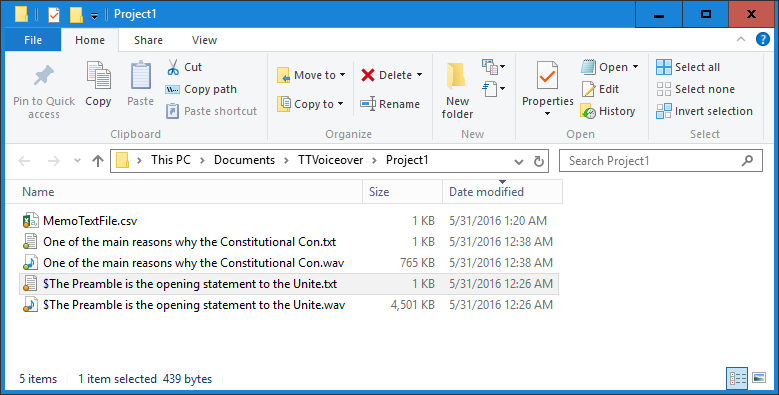 A TTVoiceOver project consists of .WAV and .TXT file pairs; each narration script is stored as a standard text file which can be loaded into the edit pane of TTVoiceOver's main window, viewed, modified, and rendered via TTS into .WAV voice audio. The speech audio can be retrieved from this location and inserted into your video or PowerPoint PPT presentation (which can be exported to video). 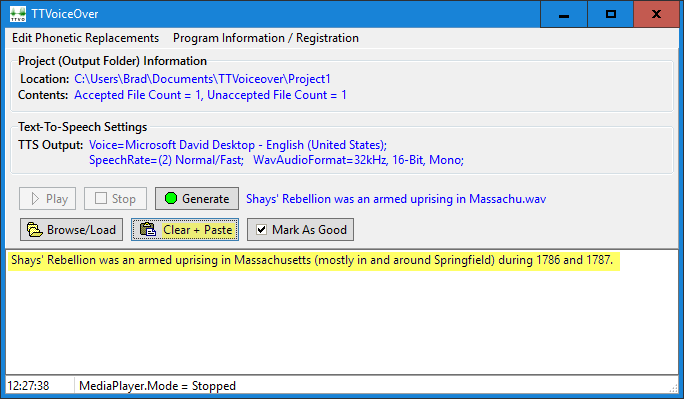 Note that the speech file names are automatically extracted from the first 50 characters of the text to speech script; this takes the burden of selecting unique and meaningful names off of the user. Also note that the '$' character is used to denote speech-audio blocks which have been accepted by the user; this designation is useful for cleaning unwanted voice files out of the folder. 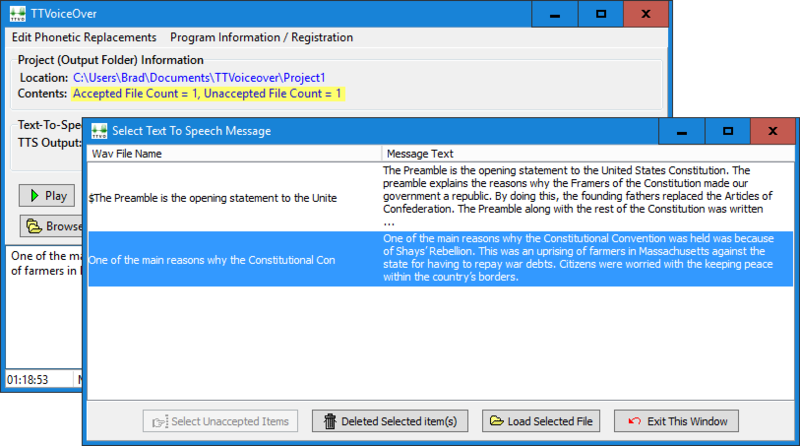 Clicking the Contents label opens the Select Text To Speech Message window; this provides a list of all TTS voice narrations in the project folder along with a larger preview of each text-to-speech script. In the example above, the first narration is marked as accepted (because the filename begins with a '$') and the second file is still considered to be unaccepted because its name does not start with '$'. The Accepted/Unaccepted count is reflected in the caption of the Contents label on the main window. The controls at the bottom of this window allow the user to select, delete or load (and modify) existing narrations. Clicking the TTS Output label opens the Text To Speech Settings configuration. From this window, you can select from one of the voices installed on your computer. Windows comes with a default male and female voice appropriate for your locale, but you can install additional voices by searching the internet. In addition to selecting a voice, you can also control the rate at which the speech is rendered by adjusting the Speech Rate scroll bar; to hear the various speech rates before OK-ing your voice selection, move the Speech Rate scroll and click Test. The Samples Per Second, Bits Per Sample, and Channels selectors allow you to control the size and quality of the .WAV audio which will be generated. For most videos and PPT presentations, speech rendered at 22,000 samples per second, 16-bits, 1-Channel (Mono) is adequate and produces a medium-sized .WAV. Lowering the quality to 8,000 Samples Per Second, 8-Bits, Mono produces the smallest .WAV, but low-quality speech audio may result in audio distortion in the PowerPoint PPT presentation and/or video. A mid-range quality selection is recommended. Open File Location: This merely opens the Output Folder in the Windows Explorer. Show WAV File Info: This opens the WAV File Graph. This graph is merely informational and allows the user to verify the contents of the TTS-generated voice WAV. The Play, Stop, and Generate buttons allow you to generate and listen to the speech audio produced by the TTS rendering of the contents of the text-editing pane. 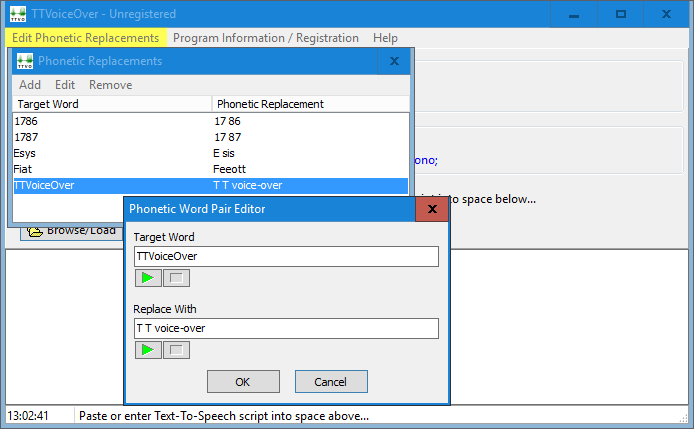 Paste desired TTS voice script into the text-editing pane. 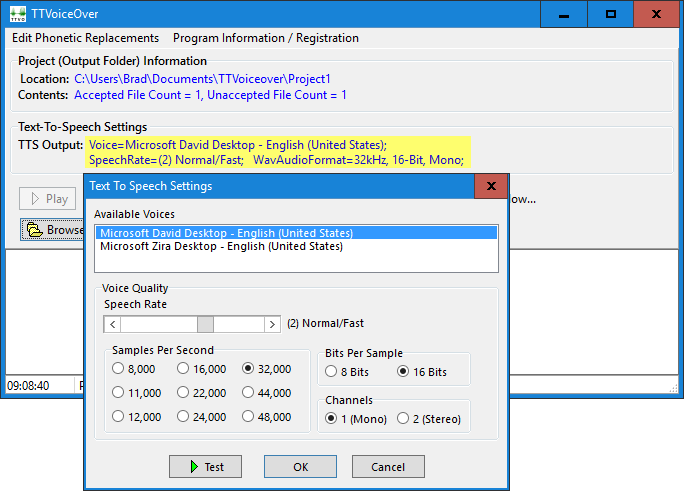 Generate a .WAV audio speech narration from the text in the edit pane. Play the resulting .WAV audio to make sure that it is acceptable. If the resulting speech audio is acceptable, it is a good idea to press the Mark As Good button to mark the .WAV as accepted; this helps you to organize and clean the contents of the project folder. In large projects, it is common to accumulate some files which are not going to be used in the final product; if the good narrations are marked appropriately, you can use the Select Unaccepted Items / Delete Selected Items buttons at the bottom of the Select Text To Speech Messages window (accessible from the Browse/Load button or the Contents label) to quickly clean the rejects out of the folder. If you want to make modifications to a voice-over narration which has already been generated, it can be reloaded into the text-editing pane by selecting it in the list and pressing Load Selected File. After making the desired changes to the narration script, you will need to once again need to Generate new TTS audio with the desired script changes. Copy text blocks from your existing composition to the Clipboard. Press Clear + Paste to transfer the text into editing pane. Press Generate to produce the TTS voice-audio narration. If you have ever dabbled with the Microsoft Text To Speech feature, you may have noticed that while it does a very good job rendering the vast majority of words, some words, especially names, don't come out properly. TTVoiceOver has a very useful feature for handling improperly pronounced words: Phonetic Replacement. If you enter any of the word pairs shown above, you can hear the differences by pressing the corresponding Play button; this allows you to hear both forms of the word/phrase to make sure that the phonetic text you have chosen for the Replace With value is an acceptable replacement for the Target Word. When you have concocted an acceptable phonetic replacement, click OK on the Phonetic Word Pair Editor dialog to add the change to the Phonetic Replacements list. After replacements have been configured, all subsequent TTS voice renderings will automatically substitute the phonetic replacements for all instances of the Target Words. 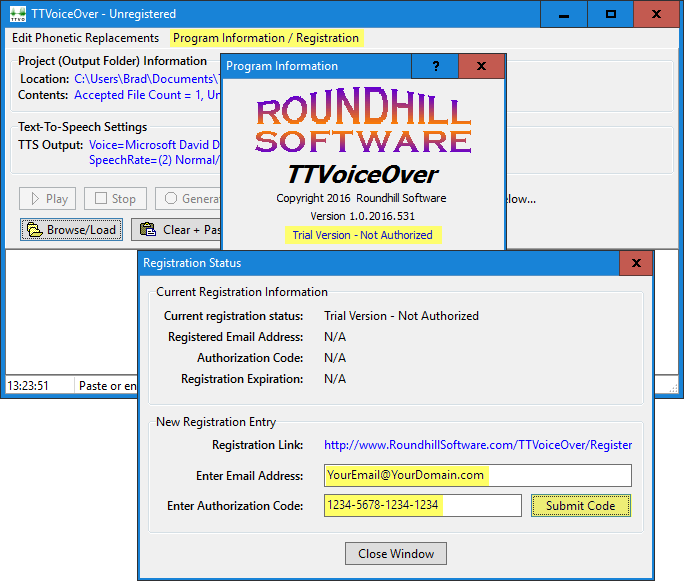 To Register TTVoiceOver, go to http://www.RoundhillSoftware.com/TTVoiceOver and follow the Registration link. Upon registering, you will be issued a software Authorization Code which will suppress the generation of the bell sound in the TTS output. Each Authorization Code is encoded to a Registered Email Address and an Expiration date. 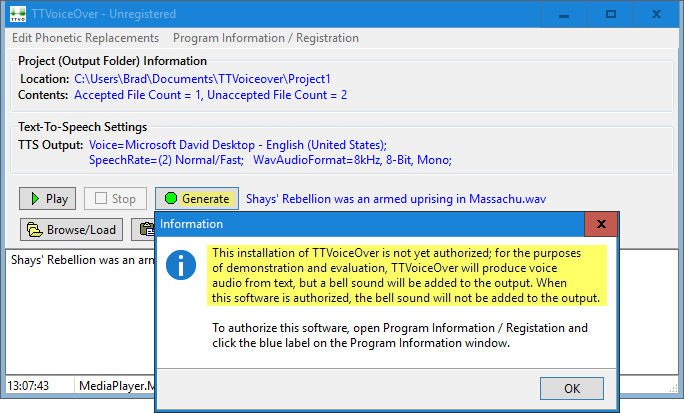 Once a valid software-authorization code has been submitted, the TTS voice output will be free of the bell sound.